Unlike B2C customers, B2B clients tend to be more business-minded and take additional marketing effort to win over. Still, that doesn’t mean they don’t want an easy, intuitive shopping experience that feels as natural as a B2C experience. On top of that, gaining clients and maintaining relationships becomes more challenging in B2B as you scale for growth – especially if your internal business processes are slow to begin with. Stay ahead of the curve with the Magento B2B module, which offers streamlined, integrated, and convenient solutions – because if you can’t keep up with the increasing demands of B2B customers, they’ll find a competitor who will. Ultimately, if your business fails to deliver a convenient B2B purchasing experience with accurate inventory and pricing, then you’re going to lose in today’s hyper-competitive landscape. Read more. What started as an effort to make a better neighborhood resulted in a new home for a pit bull mix named Striker. Digital Air Strike paired up with General Motors in September to make a Detroit-area neighborhood safer as part of the Scottsdale company’s program to give back to the community. For Christina Wofford McNamara, Digital Air Strike’s vice president of marketing and communications, finding Striker chained without food or water behind a seemingly abandoned home triggered memories of Charlie, her pet pit bull while growing up. When McNamara returned to Arizona, the wheels started turning to bring Striker to her home. A colleague offered to drive her four-legged friend here in a cross-country road trip, visiting the Indianapolis Motor Speedway, the Gateway Arch and historic Route 66 along the way. See the adventure on YouTube here. Digital Realty, an international technology company offering Data Center, Interconnection, and Colocation services that recently announced its expansion in Downtown Phoenix, was recently recognized for its sustainability efforts and innovation by two separate national groups. Read more here. After 43 percent of Americans suffered a personal data breach in the past three years, 46 percent feel less secure from cyberattacks today than they did five years ago and 56 percent feel the nation as a whole is less secure, according to results of a Harris Poll survey conducted for the University of Phoenix. “Our nation has experienced a constant uptick in ransomware attacks, malware, and personal and business data breaches yet 61 percent of U.S. adults agreed that technology is keeping up with the threat of cyberattacks,” said Dennis Bonilla, executive dean, University of Phoenix College of Information Systems & Technology and School of Business. In other survey results, 90 percent of respondents feel they would need more education to pursue a job in cybersecurity. However, the biggest barriers preventing them from pursuing a profession or education in cybersecurity were lack of time (52 percent), costs (51 percent) and lack of knowledge (40 percent). The Giant Magellan Telescope Organization has initiated the casting of the fifth of seven mirrors that will form the heart of the Giant Magellan Telescope. 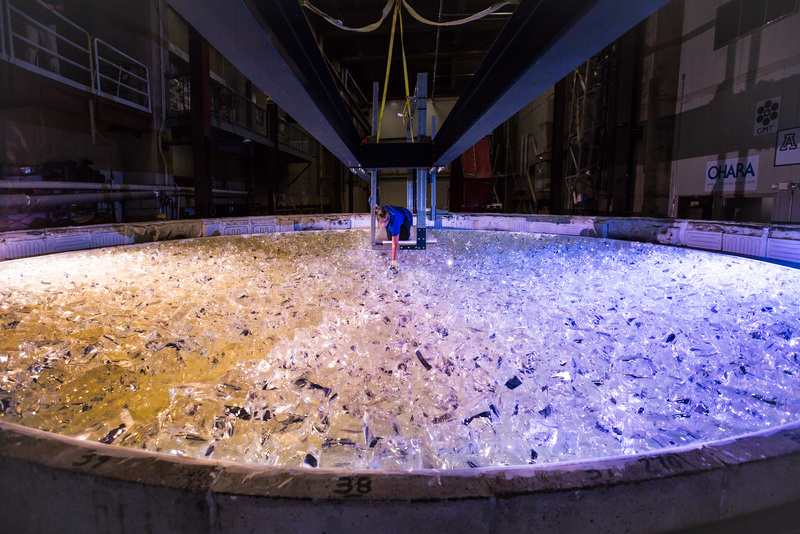 The mirror is being cast at The University of Arizona’s Richard F. Caris Mirror Laboratory, which is known for creating the world’s largest mirrors for astronomy. The process of casting the giant mirror involves melting nearly 20 tons of glass in a spinning furnace. Once cooled, the glass disk will be polished to its final shape using state-of-the-art technology developed at the university. The 25-meter diameter GMT will be sited in the Chilean Andes to study planets around other stars and to look back to the time when the first galaxies formed. The GMT will produce images 10 times sharper than those from the Hubble Space telescope in the infrared region of the spectrum. Scottsdale-based JDA Software Group has been recognized by two leading independent analyst firms for its applications of JDA Retail.me, which enables retail planners to visually plan their stores based on consumers’ buying behaviors and guided by big data intelligence. In the Gartner Magic Quadrant for Retail Assortment Management Applications Leaders’ Quadrant, JDA has again been placed the furthest along the completeness of vision axis. Gartner’s Magic Quadrant for Retail Assortment Management Applications report positions vendors within one of four quadrants based on their completeness of vision and ability to execute. The number of businesses planning to adopt mobile and automated payment technologies, including payment via mobile apps, text and interactive voice response (IVR), has increased. That is the conclusion of the 2017 Financial Services Operations and Technology Survey from Phoenix-based BillingTree, the leading payment technology provide. The survey conducted in the third quarter found credit/debit card payment acceptance via mobile app was the most sought-after technology closely followed by credit/debit payment via text and automated phone/IVR credit. Over two thirds of businesses plan to adopt new payment technologies within the next year to help increase revenue and growth. A majority of survey respondents, which included small to large credit unions, banks and auto financiers, stated they now offer a broader range of payment options, with more than half offering web portals, automated phone IVR and live agent payment support. This compares to the previous year’s findings of less than 14 percent of respondents providing all three. UAVENTURE CAPITAL is a new venture capital fund launched to support the commercialization of University of Arizona science, technology, services and intellectual property originating from faculty, students, alumni and affiliates. The fund was formed by Fletcher J. McCusker, the business driver behind The University of Arizona College of Pharmacy spin out SinfoníaRx and the founder of the public company Providence Service Corporation. Fund principals will be attorney Larry M. Hecker and accountant Michael N. Deitch. “Having access to local capital will definitely be a boost for UA technology commercialization. Tech Launch Arizona is excited to work with the fund managers,” said David Allen, vice president of Tech Launch Arizona.